There's so much to do on Hatteras you can't possibly do it all in a two week visit, especially when you spend every afternoon at the beach. However, we like to throw in a few spontaneous activities to keep everyone from settling into a routine. Hiking, kiting and biking are very low cost. Obviously, diving, flying or horseback riding are expensive, but can be budgeted as one time costs.With a student group, it helps to have multiple adults so one of you can take a group to do something while someone goes to the grocery and someone fixes lunch. By rotating duties around each day, you can keep the schedule running smoothly. One thing we're not much in favor of is free time. Even if you bring a group down to Hatteras every year, many of your kids will only make the trip once. They have all summer to lay on the sofa and watch tv, or work at their summer job. But this is the only chance they have to do what Hatteras has to offer. 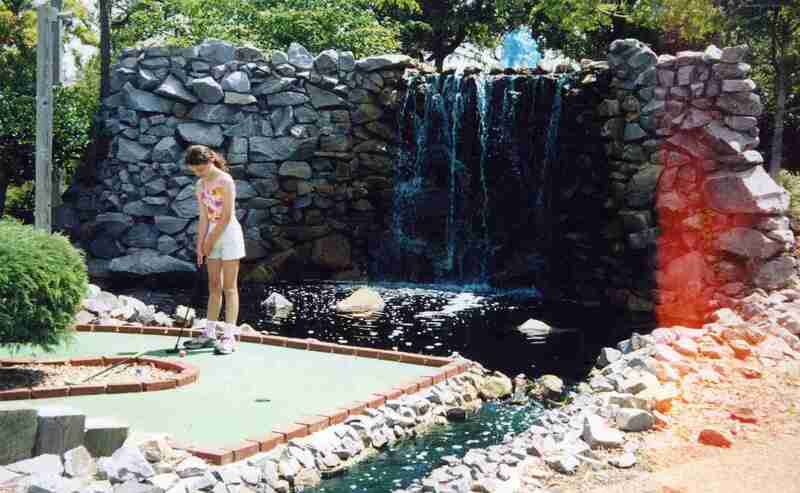 The photo at right is the very well kept miniature golf course along Route 12 in the center of Buxton. The local ice cream parlor is the blue building in back. For The Birds. The Double L Bird Zoo is certainly worth a visit, Expect to spend about an hour. This is not an impressive facility from the outside, but the birds themselves are captivating, and your experience will be up close and personal. The birds will perch on your hands, arms and shoulders. They'll gently peck your cheek, sing to you, eat from your fingers, and say a few words to you. The public tours are only a fund raiser. This is a rehabilitative center for unwanted pet birds or wild birds found injured. The eccentric who has run this center since 1993 is a very knowledgeable authority on these beautiful birds, and his underfinanced, obscure facility is one of the nation's respected aviaries. He does not buy birds, importing them from far continents, assembling the kind of carefully organized collections seen in a large zoo. Instead, he rescues them, retrieves them, accepts them from owners who have tired of them or can no longer care for them, or outdoorsmen who found them on the beaches, in the woods or fields. The collection is not planned but evolves, as birds arrive randomly. There are birds of all kinds here, but the stars of the show are the brightly colored, loud, lively, highly intelligent tropical and subtropical species. Call ahead. They only take regularly scheduled tours at noon Tuesdays, Wednesdays, Thursdays and Fridays, but for groups they may schedule a custom visit. 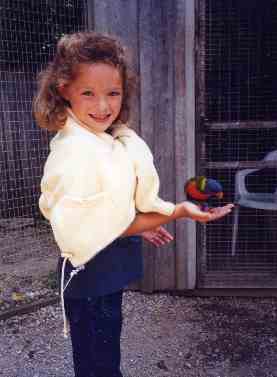 The Double L Bird Zoo is just across from the miniature gold course at the Y on Route 12 in Buxton. 252-996-0331. Take a Hike. You might not think of coming to America's greatest beach island to hike, but Hatteras offers excellent trails. A four mile loop is the North Pond - Salt Flats Trail in Pea Island Refuge. A 13 mile beach hike runs along the front beach from Rodanthe to Oregon Inlet. 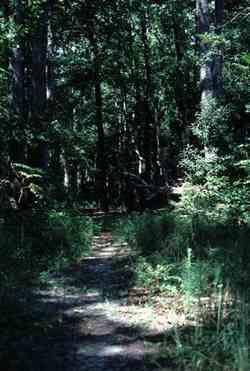 Buxton Woods (right), America's largest remaining saltwater forest, contains high dune ridges, interdunal ponds, and dense thickets. The best trailheads are off Old Doctor Road and Water Association Road. Without a four wheel drive, you should pull off Route 12 on one of those roads and park, hiking down the sand road until you find the trailhead. There are kiosks with trail maps at the trailheads. There is also a loop trail beginning at the picnic area across from the Lighthouse. A great morning walk is the five mile South Beach stretch from Buxton to Avon. Or walk the opposite direction from Lighthouse Beach South to The Cape. You can hike the beach edge of Buxton Woods from Cape Point Campground to Frisco, a six mile challenge. You can hike from Frisco Beach to South Point, another five miler. If you really want a unique walk, drive up to Nags Head and climb Jockey Ridge, the largest dune in North America. The view from on top is incredible. All of these walks can be made in one long morning. Be sure to bring twice as much water as you think you'll need, and fill them and put them in the freezer the night before so the ice will gradually melt during your hike, giving you cold water all morning. Bring bug spray or netting, and for Pea Island or Buxton Woods wear long pants. For the beach, of course, wear a swimsuit or shorts so you can go in the water and cool off periodically. Go Fly A Kite. Ever since the Wright Brothers showed that the Outer Beaches had stronger and more consistent winds than anywhere else, kite flying has been a popular activity here. Kitty Hawk Kites began as a chain of outlets serving kiters (they now offer hang gliding and kayaking as well). The Hatteras Island outlet is on the North edge of Avon. The selection of kites is beyond anything you will find back home. By advance arrangement, group lessons are available. You might think kite flying is something every kid learns at a young age, but these are special kites : dueling kites, trick kites, speed kites, high altitude kites, and other varieties. 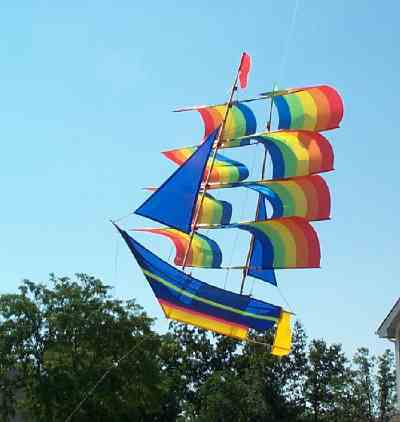 To sail these in differing wind conditions requires some techniques most kids do not know. The history and lore of kiting, the design and building of kites, the art of kites, are most efficiently picked up with lessons. You can then take a few kites to the beach in the afternoons and keep them in the air for several hours. Brace yourself, however. This is a whole new world. You'll see cows, dragons, clipper ships, White Houses, Eiffel Towers, butterflies, cartoon characters and whales up there on the end of a string. 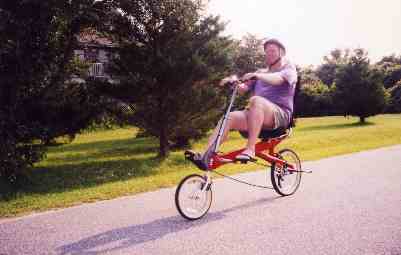 252-441-4124. www.KittyHawk.com. Check Beneath The Surface. Outer Banks Diving Shop. Amy & Johnny they take groups up to 20 out to historic shipwrecks. They serve both certified divers and snorkelers. They rent the equipment and with advance arrangement can provide instruction. The shop is on Route 12 near Slash Creek Canal on the eastern side of Hatteras Village. The 60 foot Flying Fish is docked at Teaches Lair in the village about a mile from the shop. This is a fascinating sport but it's expensive. If your kids have never done it before they will need several instructional sessions to work their way up to certification, which is required for the better locations. Still, you can't do this back home, and it's an experience you'll remember forever. 252-986-1056. www.outerbanksdiving.com. Pedal Away. Hatteras is trying to make itself into a bicycling paradise. A long distance pedalling trail has been laid out all the way around Pamlico Sound which takes a week to complete. The quiet back streets of Buxton, Hatteras Village, Avon and especially Old Kinnakeet are wonderful places to pedal. Rather than hauling our own bikes down here, we like to use our annual trip to experiment. We can rent all the different kinds of bikes we don't own : tandems, recliners, recumbents, adult tricycles, lowslungs, and passing fads, many of which last only one or two seasons. The rental agencies come and go, too, but there are always several, mostly along Route 12 in Avon. They can deliver to your campground, motel or house and pick up at the end of your stay. With a group, we rent several and let everyone take turns. Bake On The Beach. You should spend at least one evening on the beach. Dig a three feet deep hole in the sand and fill it with a fire built from driftwood. Light the fire and let it burn down to coals. With your shovel, remove some of the hot coals and lower a cast iron Dutch Oven into the hole and rest it on the remaining coals. Then replace the original coals over top of the Dutch Oven. Fill the sand in over the coals until the hole is levelled, and let dinner cook for 60 minutes. Shovel out the sand and coals and remove the Dutch Oven. If you have a larger group, you can dig a deeper hole, stack two or three Dutch Ovens, then fill in the coals and the sand. What to put in the Dutch Oven? Some like shishkebab sticks laid on a bed of rice. Some do barbecued chicken. We like stuffed Pablano peppers. There are entire books on beach cooking with Dutch Ovens, filled with a hundred recipes. It doesn't matter what you use. The cast iron Dutch Oven spreads heat evenly, focuses heat more intensely, and retains the heat even as the coals begin to cool. The same recipe cooked in a Dutch Oven in a sandhole is better than those ingredients cooked in a microwave, stovetop or aluminum pot in a kitchen oven. Caution : When you do this, station one kid at the hole to make sure no one unknowingly steps on the sand covering it. That sand will be dangerously hot and can inflict serious burns on a bare foot. Walk On The Wild Side. 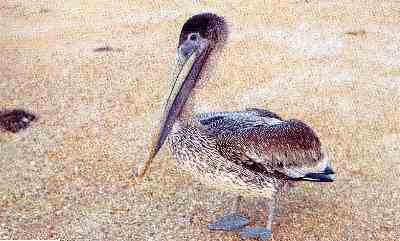 The Pea Island Wildlife Refuge is on the North side of the island, between Rodanthe and Oregon Inlet. The Visitor Center is four miles from the Inlet, and includes parking, rest rooms, exhibits, observation decks and a gift shop. Canoe tours, guided bird walks and other special programs are offered. The North Pond Trail leads to an observation tower. The heart of the refuge is a 13 mile barrier island wilderness, 5834 land acres and 25,700 acres of water, containing 365 bird species. You can see pelicans, herons, egrets, ibises, terns, gulls, skimmers, willets, stilts, swans, geese, ducks, plovers and eagles. Loggerhead sea turtles, otters, muskrats, raccoons, possums, minks, rabbits, and horseshoe crabs are found here. Bring bug spray or netting, camera (hopefully with a telephoto lens), binoculars, a good pair of walking shoes (not shower thongs or sandals), long pants (some of the trail winds through tall grass), sunglasses, and a water bottle (preferably with some ice in it). You can pick up informational brochures and maps at the Visitor Center, which is open from 9 - 4 every day. Saddle Up. 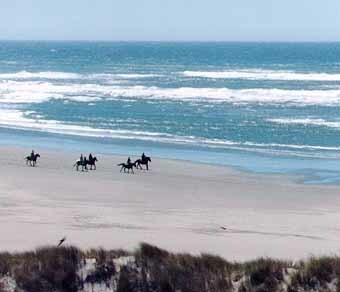 There is great horseback riding on Hatteras with Equine Adventures, just off Route 12 in Frisco. You ride through Buxton Woods, the largest integral Maritime Forest left in North America. At the far end of the trail, you come out at the beach and ride along the surf, returning by a different route. Children younger than 12 or adults over 225 pounds are not accepted, but for those old enough and svelte enough, it's a fine experience. You need bug spray or netting, but insects are not that much of a problem. Because you're riding through woods, wide brimmed hats are not as useful as baseball style caps. Sunglasses with straps are convenient, because you can hang them around your neck in the woods, then pull them on when you emerge into the sunlight of the beach. Wear long jeans; shorts would expose your legs to rubbing. You need real laceup shoes, not shower thongs or sandals. The standard guided ride lasts two hours. You need to make advance reservations. There are very few places in America where you can go horseback riding on the beach. The sunset ride on the trip down at Cedar Island is a good warmup for this one. Many groups and families do this every year. 252-995-4897. Take Off. From Billy Mitchell Airport in Frisco you can take 30-45-60 minute flights over Hatteras Island between Hatteras Village and the Lighthouse (30 minutes), over Hatteras Island all the way to the North End (60 minutes), and over Ocracoke Island (45 minutes). Burris Flying Service offers these trips in a small Cessna (shown left) which flies low so you can get great photos. Many of the photos on this website were taken during one of these flights. Burris can also customize a flight for you with advance arrangement. For instance, they could fly you up to Jockeys Ridge and the Wright Memorial. The pilot will fill you in on many details about the island. The Cessna can hold three people comfortably or four if one is a kid. A person in the front passenger seat may be invited to help fly the plane, although many decline so they can concentrate on taking photos. Until you take this flight, you cannot grasp what Diamond Shoals, Hatteras Inlet and Buxton Woods really look like. Reservations must be made by phone. 252-986-2679. Fly Your Own Rig. Because of the heritage of the Wright Brothers, and because the same conditions they sought still exist here today, the Outer Banks have long been a mecca for Hang Gliding. Jockey ridge, the giant dune on the other side of Oregon Inlet, is one of the top spots in the world for learning this sport. Kitty Hawk Kites, with its original headquarters right across the road, offers beginner, intermediate and advanced lessons with varying levels of certification. The lessons include equipment rental. 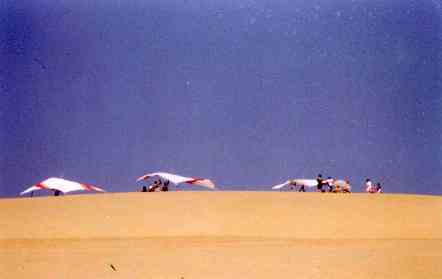 The photo at right shows the gliders perched atop the dune during a lesson. The photo at top right shows a beginner in midflight. Unlike back on the mainland, where hang gliders launch from rooftops and cliffs, here you're never far above the cushioning sand. 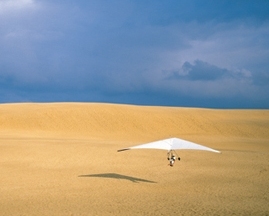 Jockey Ridge itself is an adventure; it's the largest "live" dune system in North America. 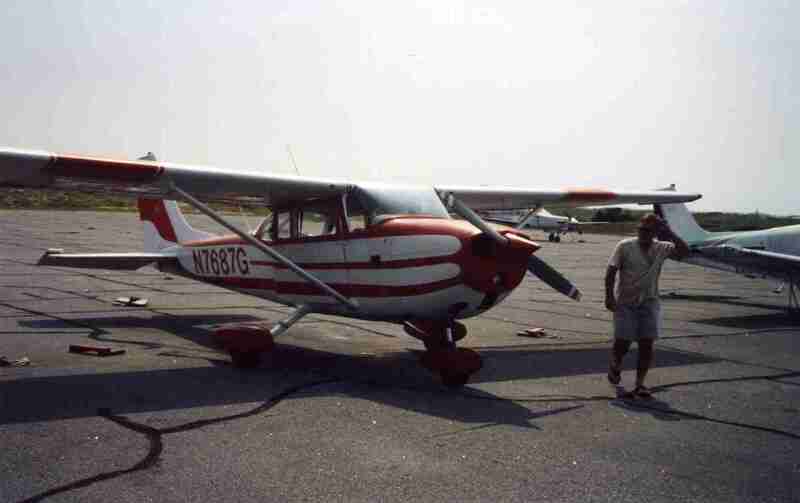 252-441-4124. www.KittyHawk.com. Tee off. 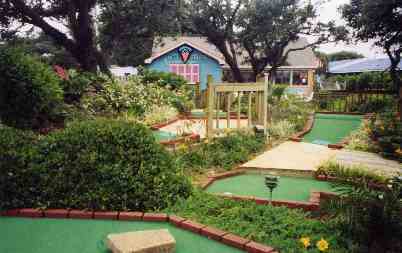 There are three miniature golf courses, a Pitch n Putt course and a full sized nine hole golf course on Hatteras Island. The salt air, constant wind, heat and violent storms make it difficult to maintain them, but the local owners do a great job. 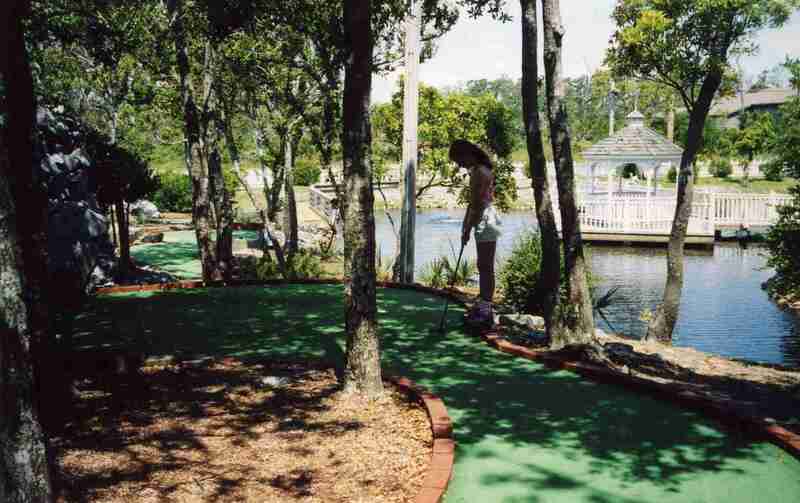 Avon Golf, the PitchnPutt course, is right in front of the Avon Fishing Pier. You play all day for $8. Ocean Edge is the nine hole course in Frisco. It's $20 for one round which includes cart. Uncle Eddy's, shown upper right, is next to the Falcon Motel in Buxton. It offers 18 holes under a grove of live oaks. You play all day for $5. It is a very well landscaped, tightly designed course with tight carpets. At the 18th hole you can celebrate with Eddy's famous custard, 50 flavors of it. Cool Wave Mini Golf is in the Y. With its windmill it's hard to miss. It's cute and the wave hole is funny, sending half the balls out across the road. It is a very compact layout. But the class of the island is Frisco Mini Golf, shown here and top left, a beautiful national class layout with lakes, streams, waterfalls, and very challenging, tightly carpeted holes. Your final option is a visit to the Hatteras Village Marinas to watch the commercial fishing fleet unload the daily catch. Especially if your family or group is from far inland where the kids never get to see this, it gives them a firsthand look at where their food comes from, whether they eat it in a restaurant or their mother buys it in a grocery. You should show up at 4 pm. The boats should be coming in between 4 and 5. You'll see about 60% tuna, mahi mahi, and wahoo, with the other 40% composed of a wide variety of other fish. You'll see the fish netted onto the docks, where they'll be taken away to be cleaned, iced and sent to the processing houses. Around the corner, at the other docks, the sport charter boats will also be coming in between 4 and 5. 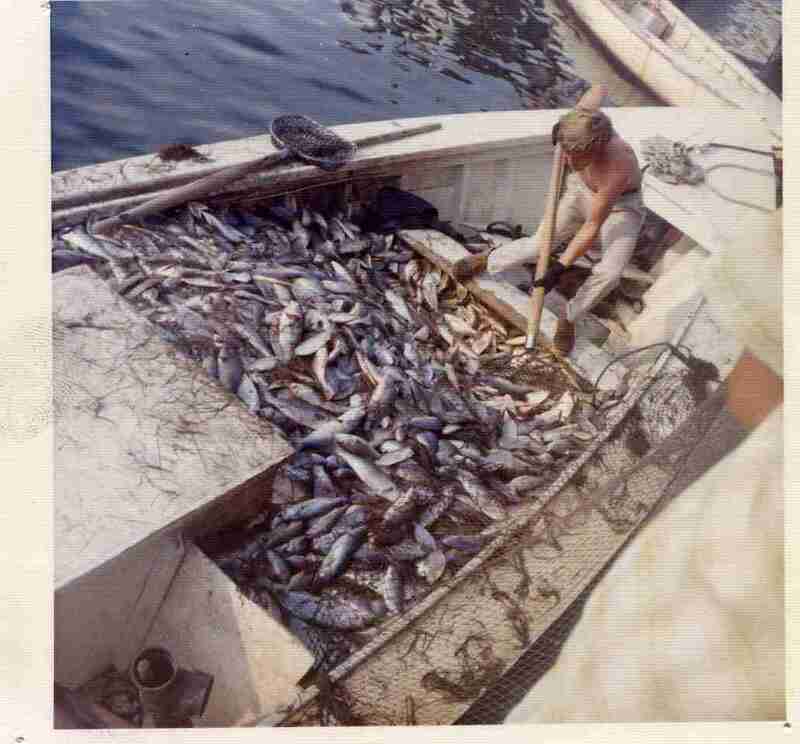 Much of modern sport fishing is catch and release, so their catches are not as impressive as they once were, but they still bring in quite a bit. The white marlin, blue marlin, and sailfish are released. But you'll see plenty of yellowfin tuna unloaded, which many Hatteras locals believe is the best eating of all the ocean fish. The big trophy fish on the sport charter boats is a giant bluefin tuna, but in June, July and August odds of seeing these are low.